The Econo Lodge City Square motel is located in the heart of Melbourne on Swanston Street directly opposite the city square, surrounded by theatres, cafes, restaurants and department stores. 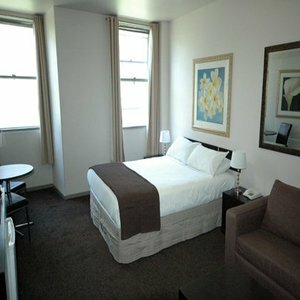 A short walk to Flinders Street station, Federation Square, Crown Casino, MCG, Rod Laver Arena and the Etihad Stadium. This is your perfect place stay, offering comfortable, clean and affordable accommodation. The motel offers single, double and triple rooms for short or long stays at an reasonable price with a light breakfast included. Only taxis can drive along Swanston St. There are several car parks surrounding the motel. We recommend driving down Flinders Lane from Spring St, end and turning right into the City Square car park, just past the Westin Hotel entrance. Also the cheapest park around.